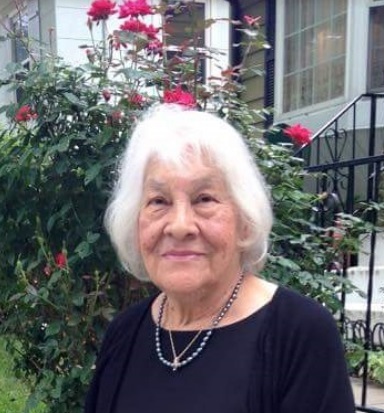 Erlinda "Linda" Hernandez, 83, of Liberty, passed away peacefully at her home on April 11, 2018, with family at her side. Visitation will begin at 10:00 am, Rosary at 11:30 am, and Mass of Christian burial at 12:00 pm, on Monday, April 16, at St. James Catholic Church, 309 South Stewart Road, Liberty. Private burial in Resurrection Cemetery. In lieu of flowers, memorial contributions are suggested to the St. James Building Fund. Linda was born July 31, 1934, in Holiday, KS, the ninth of ten children of Eligio and Gregoria (Sanchez) Hernandez. Along with her parents, Linda was preceded in death by seven siblings. She was a lifelong Catholic and member of St. James parish. Survivors include her husband of 57 years, Fidencio; children, Monica Hernandez, Carlos Hernandez (Debbie, deceased), Carmen Siemens (Brett), Carla Williams (Paul), Leslie Hernandez Brown (Michael) and Raquel Starner (Paul); nine grandchildren; Cory, Siera, Jena, Calen, Hunter, Carmen, Cristyn, Sterling and Amberly; sisters, Jovita Martinez and Virginia Martinez; as well as many nieces, nephews, and other family members.